Imago Vergilii saeculo quinto ficta. Publius Vergilius Maro fuit poeta Romanus qui aetate Augusti floruit. Tribus innotuit litterarum Latinarum operibus maioribus: Bucolicis, Georgicis, et Aeneide carmine heroico; de quibus vide infra. Nonnulla poemata minora, in Appendice Vergiliana collecta, ei aliquando tribuuntur. Nocte die tutum carpe, viator, iter. 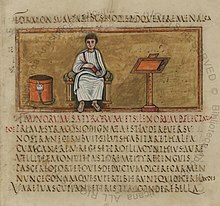 Postquam Cremona auxilium auctoribus Caesaris caedis, qui anno 42 apud Philippos victi sunt, tulerat, veteranis huiusce belli sola his in locis sita, quorum in numero villa Vergilii erat, praemio data sunt. Inter amicos Vergilii fuerunt C. Cornelius Gallus poeta (Ecl. 6.64, 10 passim), P. Alfenius Varus (Ecl. 6.7), C. Asinius Pollio poeta et consul, Q. Horatius Flaccus poeta, ac Maecenas, cui Georgica dedicavit. Vergilio mortuo, Lucius Varius Rufus et Plotius Tucca Aeneidem edendum curaverunt. Poeta autem maluit carmen perdere, quod nondum finitum est: plures versus imperfecti manent. Structura autem et historia formam ultimam habuerunt. Nam secundum Vitam Vergilii, poeta "Aeneida prosa prius oratione formatam digestamque in duodecem libros particulatim componere instituit, prout liberet quidque, et nihil in ordinem arripiens. Ac ne quid impetum moraretur, quaedam imperfecta transmisit, alia levissimis verbis veluti fulsit, quae per iocum pro tibicinibus interponi aiebat ad sustinendum opus, donec solidae columnae advenirent." Hac ratione invenimus aliquos versus qui non sunt integra hexametra, ut "Hic cursus fuit" (1.534). Vergilius Dantae novum circulum Inferni monstrat: imago a Gustavo Doré picta. Pagina a Gulielmo Blake scripta res de Carminibus Homeri et de Vergilio continet. Multi Christiani crediderunt eum Christianum fuisse, quippe quo Vergilius, quarto Eclogarum poemate, scripserat de infante qui mundum recturum esset: multi putabant illum de Iesu Christo dixisse. Homines Aevo Medio solebant, nomine sortes Vergilianae, fortuitum versum ex Aeneide carpere, credentes quia revelaret quomodo viverent. Nomen Vergilii nonnumquam Virgilius est traditum ab hominibus, qui illum magum fuisse ob eamque rem virga usum esse. Dantes Alagherius Vergilio partem dedit in Divina Comoedia: Vergilius narratorem per infernum duxit. Georgicon libri IV, qui sunt carmina didactica de agricultura; quos septem perfecit annis. Aeneidos libri XII. Sunt de Aenea, viro Troiano, qui in Africam et inde in Latium perfugit, ubi Lavinium urbem condidit; quos undecim perfecit annis. Omnia opera certissime a Vergilio scripta versu hexametro utuntur. ↑ Orthographia falsa "Virgilius" interdum reperitur: vide partem de fortuna. ↑ P. Alfenius Varus fuit consul suffectus anno 39 a.C.n. ; non agitur de P. Quinctilio Varo, qui longe minor natu fuit. V. Clausen ad Ecl. 6.6-7. ↑ Anderson et Quartarone, p. 38, et Sparrow, p. 8, hoc explicant. Bauzá, Hugo Francisco. Virgilio y su tiempo. Tres Cantos: Akal, 2008. ISBN 9788446024019. Briggs, Ward W. Narrative and Simile from the Georgics in the Aeneid. Lugduni Batavorum: Brill, 1980. ISBN 9004060367. Buckham, Philip Wentworth. Joseph Spence, Edward Holdsworth, William Warburton, et John Jortin. 1825. Miscellanea Virgiliana: In Scriptis Maxime Eruditorum Virorum Varie Dispersa, in Unum Fasciculum Collecta. Cantabrigiae: Printed for W. P. Grant. Bunson, Matthew. 2014. Encyclopedia of the Roman Empire. Infobase Publishing. ISBN 978-1438110271. Comparetti, Domenico. Virgilio nel medio evo. Labrone: F. Vigo, 1872. Cox, Fiona. Sibylline Sisters: Virgil's Presence in Contemporary Women's Writing. Oxonii: Oxford University Press, 2011. Iohannes Albertus Fabricius, Bibliotheca Latina (Hamburgi: Schillerus, 1712) textus pp. 201–233. Farrell, Joseph, et Damien P. Nelis, edd. Augustan Poetry and the Roman Republic. Oxonii: Oxford University Press, 2013. ISBN 9780199587223. Formicola, Crescenzo. Virgilio: etica poetica politica. Neapoli: Liguori, 2012. ISBN 9788820757908. Knight, W. F. Jackson. Accentual Symmetry in Vergil. Oxonii: B. Blackwell, 1939. O'Hara, James J. True Names: Vergil and the Alexandrian Tradition of Etymological Wordplay. Ann Arbor: University of Michigan Press, 1996. ISBN 0472106600. Oppermann, Hans. Wege zu Vergil: drei Jahrzehnte Begegnungen in Dichtung un Wissenschaft. Darmstadii: Wissenschlaftliche Buchgesellschaft, 1976. ISBN 3534008065. Pasini, Gian Franco. Grammatica del chiasmo in Virgilio. Bononiae: CLUEB, 1991. Petrini, Mark. The Child and the Hero: Coming of Age in Catullus and Vergil. Ann Arbor: University of Michigan Press, 1997. ISBN 0472104608. Polleichtner, Wolfgang. Emotional Questions: Vergil, the Emotions, and the Transformation of Epic Poetry: an Analysis of Select Scenes. Augustae Treverorum: Wissehschlaftlicher Verlag Trier, 2009. ISBN 9783868211894. Rand, Edward Kennard. The Mediaeval Virgil. Cantabridgiae Massachusettae: Harvard University Press, 1932. Roberts, John. 2007. The Oxford Dictionary of the Classical World. Oxoniae: Oxford University Press. ISBN 978-0192801463. Google Books. Sparrow, John. 1931. Half-Lines and Repetitions in Virgil. Oxonii: Clarendon Press. Thomas, Richard F. 1999. Reading Virgil and his Texts: Studies in Intertextuality. Ann Arbor: University of Michigan Press. ISBN 0472108972. Thomas, Richard F. 2001. Virgil and the Augustan Reception. Cantabridgiae: Cambridge University Press. Ziolkowski, Jan M., et Michael C. J. Putnam, eds. 2008. The Virgilian Tradition: The First Fifteen Hundred Years. Portu Novo: Yale University Press. ISBN 9780300108224. Vicimedia Communia plura habent quae ad Vergilium spectant. Vicicitatio habet citationes quae ad Publius Vergilius Maro spectant. Vide Publius Vergilius Maro apud Vicifontem. Novissima mutatio die 17 Martii 2019 hora 11:31 facta.